DeWalt - Fits: cmeg200 type 10, d28115 type 1, d28111s-b3 type 1, d28111-b3 type 2, d28114-b2 type 1, d28114 type 1, d28110k type 1, d28065 type 1, d28131 type 1, d28111sk-b3 type 1, d28112-b3 type 2, d28114n type 1, d28111sk-b3 type 2, d28112 type 2, d28065n type 1, D28115N Type 1, d28114-ar type 1, d28112-br type 1, d28111s-b3 type 2, d28110 type 1, d28112 type 1, . D28136-br type 1, dc411b type 1, d28144n type 1, d28140 type 1, d28402 type 2, d28402k type 2, dc413kl type 1, d28402-b3 type 2, d28402n type 1, d28402b type 2, d28402k type 1, d28402 type 1, d28402-b3 type 1, dc411ka type 1, d28402n type 2, d28144 type 1, DC411KA Type 2, dc411b type 2, dc411b type 2, . 5/8-11 - DeWalt N134467 Pack of 2 Angle Grinder Hex Hole Flange Nuts - Dc415kl type 1, dcg412b type 3, dcg412m2-b2 type 3, dcg412m2-ar type 3, dcg412b type 1, dcg412m2-ar type 3, dcg412l2 type 1, dcg412m2-b2 type 3, dcg412m2 type 1, dcg412b type 3, DCG412B Type 2, DCG412M2-B2C Type 3. Dewalt hex hole Flange Nuts Pack of 2. Genuine oEM DeWalt part. Stanley Black&Decker - Compatible with: dewalt: dc415 type 1 cut off Tool, D28065 Type 1 Small Angle Grinder. D28065n type 1 small Angle Grinder. D28110 type 1 Grinder. D28112 type 1 grinder, d28131 type 1 grinder, d28144n type 1 grinder, d28402n type 1 small angle grinder, dcg412b type 1 20v max cut-off tool, d28402k type 2 4-1/2 small angle ginder, dc413 28v cordless cut off kit, d28144 type 1 grinder, dc411 18v cut off tool, d28402k type 1 4-1/2 small angle ginder, d28115n type 1 grinder, d28115 type 1 grinder, d28140 type 1 Grinder, DCG412L2 Type 1 20V Cut-Off Tool, D28114N Type 1 Grinder, D28402 Type 1 Small Angle Grinder, D28114 Type 1 Grinder, Dewalt : DC415 Type 1 Cut Off Tool, DC411KA Type 1 18V Cut Off Tool, D28065 Type 1 Small Angle Grinder. D28065n type 1 small Angle Grinder. D28110 type 1 Grinder. D28112 type 1 grinder, d28144n type 1 grinder, d28115n type 1 grinder, dc413 28v cordless cut off kit, d28402k type 1 4-1/2 small angle ginder, d28144 type 1 grinder, d28140 type 1 grinder, dcg412b type 1 20v max cut-off tool, d28115 type 1 grinder, dc411ka type 1 18v cut off tool, dc411 18v cut off tool, dcg412l2 type 1 20v cut-off tool, D28114N Type 1 Grinder, D28402 Type 1 Small Angle Grinder, D28114 Type 1 Grinder, D28402N Type 1 Small Angle Grinder, D28131 Type 1 Grinder, D28402K Type 2 4-1/2 Small Angle Ginder Includes 2 633257-00SV Flanges. 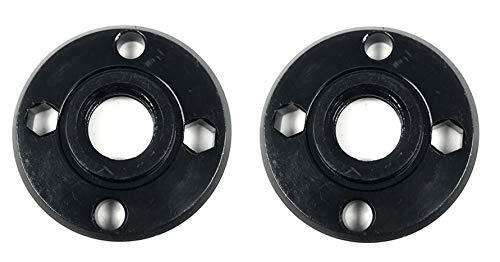 Dewalt D28110/D28402 Grinder Backing Flange 2 Pack # 633257-00SV-2PK - Includes 2 633257-00SV Flanges. Genuine DeWalt Replacement Part. Consult owners manual for proper part number identification and proper installation. New, bulk Packed. Dewalt DW4706 - Includes 2 633257-00SV Flanges. Adapters for use on the dw402 grinder, 5/8"-11 shaft grinders to mount type 1 cutoff wheels. Genuine DeWalt Replacement Part. Please refer to list for compatibility. New, bulk Packed. Adapters for wire wheels and cutoff blades. Consult owners manual for proper part number identification and proper installation. Dewalt 40168000 - Adapters for wire wheels and cutoff blades. Consult owners manual for proper part number identification and proper installation. Genuine DeWalt Replacement Part. Please refer to list for compatibility. New, bulk Packed. For use with dewalt dw831, DW402, and DW402K. Dewalt 401680-00 specifications:2 prong spanner wrenchdewalts 401680-00 features:For use with Dewalt DW831, DW402, and DW402K Includes 2 633257-00SV Flanges. 5a 5" sjs angle grinder 9565pc 5" sjs angle grinder 9554nb angle grinder GA4530 4-1/2" Angle Grinder 9015A Angle Grinder. New, bulk Packed. Fit for dewalt milwaukee makita 193465-4 Bosch Black & Decker Ryobi. Outer nut size: 5/8"-11，fits all 4-1/2", 5" and 7" grinders that have a 5/8"-11 threaded shaft. Consult owners manual for proper part number identification and proper installation. 5a 5" angle grinder 9564pc 4-1/2" sjs angle grinder 9557nb angle grinder 9558pb angle grinder ga6020 6" Angle Grinder 9005B Grinder 9503BH Grinder 9524NB Grinder 9528PB Grinder. Includes 2 633257-00SV Flanges. For use with dewalt dw831, DW402, and DW402K. Genuine DeWalt Replacement Part. Dewalt 5140001-90 Angle Grinder Replacement Flange & Wrench - 5a 5" angle grinder 9564pc 4-1/2" sjs angle grinder 9557nb angle grinder 9558pb angle grinder ga6020 6" Angle Grinder 9005B Grinder 9503BH Grinder 9524NB Grinder 9528PB Grinder. Dewalt 5140001-90 angle grinder replacement flange & wrench this part is compatible with the following machines:dewaltdw402 type 4 angle grinderdw402G Type 4 Angle GrinderDW402G Type 6 Angle GrinderDW818 Type 4 Angle GrinderDW827 Type 1 GrinderDW831 Type 3 Angle GrinderDW831 Type 4 Angle GrinderBlack and DeckerDW827 Type 1 6In. Includes 1 5140001-90 Wrench. High power sag includes 2 633257-00SV Flanges. 5a 5" sjs angle grinder 9565pc 5" sjs angle grinder 9554nb angle grinder GA4530 4-1/2" Angle Grinder 9015A Angle Grinder. Consult owners manual for proper part number identification and proper installation. Part number N115381. Adapters for wire wheels and cutoff blades. The product is manufactured in USA. Consult owners manual for proper part number identification and proper installation. DEWALT N115381 Clamp Washer - Includes 2 633257-00SV Flanges. Oem part number N115381. Dewalt 39766101 - New, bulk Packed. Genuine DeWalt Replacement Part. Please refer to list for compatibility. Fit for makita: 9029 grinder 9069 angle grinder 9016db angle grinder 9047l angle grinder 9558nb angle grinder 9557pb angle grinder ga5020 105a 5" sjs angle grinder 9565pc 5" sjs angle grinder 9554nb angle grinder GA4530 4-1/2" Angle Grinder 9015A Angle Grinder. Dewalt 397661-01 specifications: size: 4-1/2" dewalt 397661-01 features: for use with dc410a, dw802, dw818, dc411, dc413, dw818, dw802g, d28402k, d28402, dc415, d28112, d28402n, dcg412l2, dcG412B, DC411KA, D28402K Includes 2 633257-00SV Flanges. Outer nut size: 5/8"-11，fits all 4-1/2", 5" and 7" grinders that have a 5/8"-11 threaded shaft. DeWalt 397661-01 4.5" Grinder Guard - Oem part number N115381. Sold on Amazon. This is a deWALT replacement part. Part. Part number N115381. For use with dewalt dw831, DW402, and DW402K. Fits various DEWALT models. Adapters for wire wheels and cutoff blades. This is an O.
Yosoo yosoo-1026-1 - Adapters for wire wheels and cutoff blades. Accessories only. 4. Specifications: color: Silver & black Material: Metal Outer Diameter: Approx. Monitors are not calibrated same, item color displayed in photos may be showing slightly different from the real object. Please take the real one as standard. Includes 1 5140001-90 Wrench. Fit for makita: 9029 grinder 9069 angle grinder 9016db angle grinder 9047l angle grinder 9558nb angle grinder 9557pb angle grinder ga5020 105a 5" sjs angle grinder 9565pc 5" sjs angle grinder 9554nb angle grinder GA4530 4-1/2" Angle Grinder 9015A Angle Grinder. Genuine DeWalt Replacement Part. Part number N115381. Angle Grinder Flange, 2 x Pair Replacement Electrical Angle Grinder Fitting Part Inner Outer Flange Nuts for Makita 9523 - Color: Silver, black. Sold on Amazon. Fixing component, industrial and construction fasteners. Accessories only, Makita 9523 angle grinder is not included. This is an O. E. M. Please allow 1-2mm error due to manual measurement. Stanley Black&Decker 650916-01 - New, bulk Packed. 2. For use with dewalt dw831, DW402, and DW402K. Please refer to list for compatibility. Sold on Amazon. Color: Silver, black. It is only used for makita 9523 angle grinder motor rotor. It fit angle grinders with a 3/8 inch arbor/shaft. New, bulk Packed. Part number N115381. Adapters for wire wheels and cutoff blades. Genuine DeWalt Replacement Part. Genuine DeWalt Replacement Part. Includes 1 5140001-90 Wrench. Sold on Amazon. New, bulk Packed. Oem part number N115381. This is an O. E. M. 5. Used widely in the home and office appliance, communication equipments, ship assembly and other machinery industry. Fixing component, industrial and construction fasteners. Dewalt 28402 Grinder Replacement Carbon Brush Set of 2 # 650916-01-2pk - This is an O. E. M authorized part. 5a 5" angle grinder 9564pc 4-1/2" sjs angle grinder 9557nb angle grinder 9558pb angle grinder ga6020 6" Angle Grinder 9005B Grinder 9503BH Grinder 9524NB Grinder 9528PB Grinder. 4. Please refer to list for compatibility. Fits various DEWALT models. 83 inches, thread 5/8-11 inches, maximum speed 8000 rpm, for Type 1 Cutting Wheel Includes 2 633257-00SV Flanges. DEWALT D284932 Flange Set for Large Angle Grinder Type 1 cutting wheels - Fit for makita: 9029 grinder 9069 angle grinder 9016db angle grinder 9047l angle grinder 9558nb angle grinder 9557pb angle grinder ga5020 105a 5" sjs angle grinder 9565pc 5" sjs angle grinder 9554nb angle grinder GA4530 4-1/2" Angle Grinder 9015A Angle Grinder. Sold on Amazon. Sold on Amazon. Fixing component, industrial and construction fasteners.